This article describes a machine language program that can be used to measure seven successive small time intervals, using the CBM Parallel User Port (PUP), and eight phototransistors, to the nearest 1/10000s. Since no page zero locations are used, this program should run on any PET (except 4.0, since it would need to be moved above 864 decimal for 4.0 BASIC). Only the bottom row of contacts will be used. The top row of contacts are for use by CBM diagnostic routines during servicing. On the bottom row of contacts, Pin M is the CB2 line, used in many programs for sound effects; contacts A and N are grounds, and contact B is the CA1 line. We will use contacts C,D,E,F,H,J,K and L, known as PA0, PA1, PA2, PA3, PA4, PA5, PA6 and PA7, the programmable input/output lines, to receive information from eight phototransistors, the detectors of the position of some moving object. The eight lines are treated by the PET as a single memory location, 59471 in decimal or $E84F in hexadecimal. It is known as the ORA, the output register for I/O Port A, without handshaking. At any time, a PEEK(59471) will indicate the condition of the ORA. The DDR A, the data direction register for Port A, is used to designate which are the input and which are the output lines of the ORA. Its address is 59459 or $E843. A zero in bit three would make PA3 an input line and a one would make it an output line. If you POKE 59459,76 then PA2, PA3 and PA6 will be output lines and the rest input lines, since 76 in binary is 01001100. In this timer, all eight lines are made inputs by POKE 59459,0. A PEEK(59459) when the CBM is first turned on will show that all the lines are initially inputs. When running, the timer program looks at the contents of the ORA again and again. To understand the result, the contents of 59471 must be expressed as a binary number. Each of the eight I/O lines corresponds to one bit in this number. Any line grounded will be represented as a 0. If not grounded, it will be represented as a 1. More exactly, if a resistance of less than about 2000Ω is connected from a PA line to GND, the state of the line will be interpreted as a 0. If the resistance is more than 2000Ω, it will be interpreted as a 1. The collectors of eight FPT100 phototransistors are connected to the eight PA lines, and their emitters to ground at contact N. When enough light strikes a phototransistor such as the FPT100, its resistance falls to about 200Ω. This is interpreted as a 0 in the ORA. When the light is cut off, the resistance increases dramatically and is interpreted as a 1. As an object passes by a phototransistor, the state of that PA line will change from 0 to 1 and back to 0 as the light is temporarily interrupted. I have placed the phototransistors in holes drilled in a meter stick 15 cm apart. The position of the first phototransistor must be adjustable to start the timer at the correct moment. 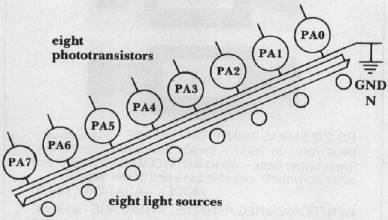 Opposite each phototransistor is a small flashlight bulb attached to a second meter stick. The two meter sticks are placed on either side of a ramp. A large ball bearing rolling down the ramp will be timed as it interrupts each light beam in turn. If the times you wished to measure were long, you could write a BASIC program to measure these time intervals, using the internal "jiffy" clock of the PET. The light to each phototransistor would have to be cut off long enough that it would still be cut off when the program got around to checking the state of 59471. To fully utilize the 1 megacycle clock in the CBM, a machine language program must be used. The program begins by setting the interrupt flag. This will ensure that the timmig will not be interrupted by the CBM as it performs its normal interrupt every 1/60 s, to update its clock, flash the cursor if needed, etc. It then goes into a loop to load all the various memory locations used to store the times, with zeros. At the same time it prints a ? at the top left of the screen. It then goes into a second loop to wait for PA? to become 1 when the ball is rolled into place at the top of the ramp. An R for READY now appears on the screen. The following table shows how the ORA changes as the ball rolls down the ramp. When 59471 becomes 0, the timer enters a timing loop. Each time through the loop it checks 59471 for a 0, then adds 1 to a counter. When 59471 has the next expected value, the contents of this counter are stored, and the timing resumes, continuing until all seven times have been measured. When the program returns to BASIC, the contents of the memory locations containing the count can be recalled and converted to seconds. Since each timing loop takes 43 cycles of the CBM's internal 1 megacycle clock, each count represents 43 microseconds. The count is contained in three locations. The first is incremented in each loop. The second is incremented only when the first passes 255 and becomes 0 again. The third is incremented only when the second passes 255 and becomes 0 again. The largest count possible is then (255×256×256) + (255×256) + 255 or 16777215. This is slightly more than 12 minutes. I have included a second copy of the machine language program which shows the timing loop. Beside each step I have written the number of cycles of the PET's internal clock that are needed to complete each step. The total number of cycles is 43. Some extra time is used to store the count as each phototransistor is passed. If you wish, this could be calculated and added on to the total time as a correction. I have also included a BASIC program to operate the clock in an organized fashion. It asks you how many runs you wish to make down the ramp, then stores the seven times for each run. Eventually, the average time for each part of the run is calculated. With a few minor changes, this program can be used in almost any situation where accurate timing is needed. 2 Load the accum with the code for ? 36 0387 69 00        ADC #00.